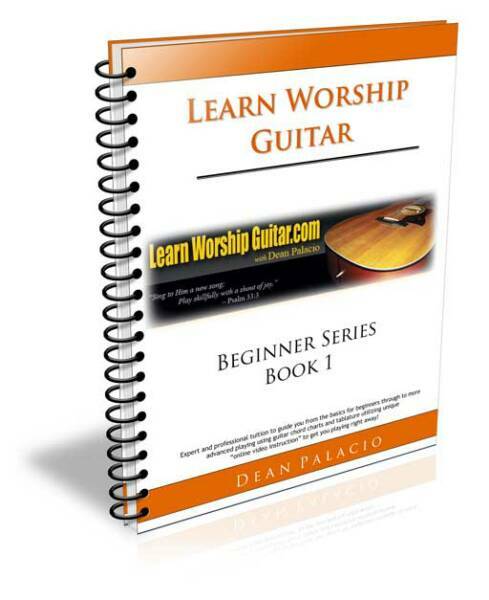 After much anticipation and feedback the Learn Worship Guitar Beginner Series Book 1 ebook & Videos are complete! Below are some samples from the inside. The above examples are sample pages from the book which is a download. This ebook contains 50 pages of detailed instruction, pictures and exercises that will get you playing in hours/days not months! 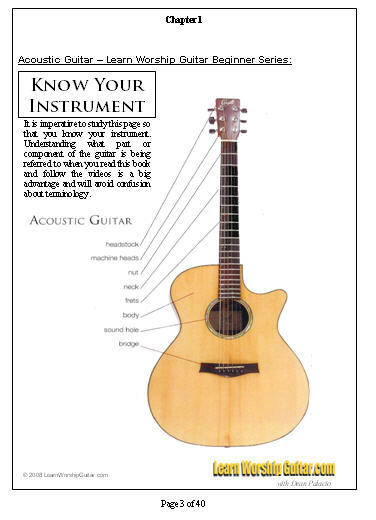 all the basic necessities like picks, tuner, stand, chair to holding the guitar, proper form and posture, tuning, the 4 basic chords and finally concluding with strumming patterns and worship songs that you will be able to play with ease! Also Included are song charts for songs like "How Great Is Our God", "Holy Is The Lord", "Every Move I Make", "Holy And Anointed One" just to name a few! 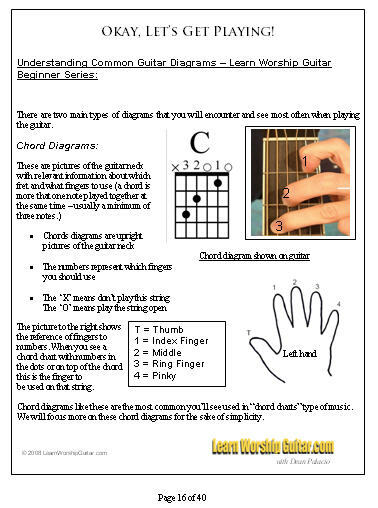 You will also get the accompanying video for each song revealing all the details of how to chord, strum and sing each song! The exciting part of this package is the accompanying videos that will walk you through step-by-step, page by page of this ebook so you will have everything you need to start playing and worshiping right away! It will be like having me as your personal, private guitar teacher in the comfort of your home and computer any time day or night you choose to play or practice and learn! Below is a sample video of how you can expect to see the actual lesson videos. 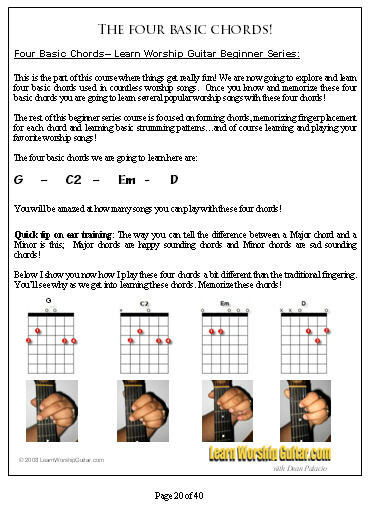 It features a my unique view including chord hand and strumming hand in a split screen view with detailed animations to follow for each step of the lesson. This gives you the complete experience of the actual lesson videos. Click on the link below! Cool! So When Can I Get it...? The ebook and videos are complete and ready for release now! The detail that is in this amazing virtual lesson package takes much time to get it just right. 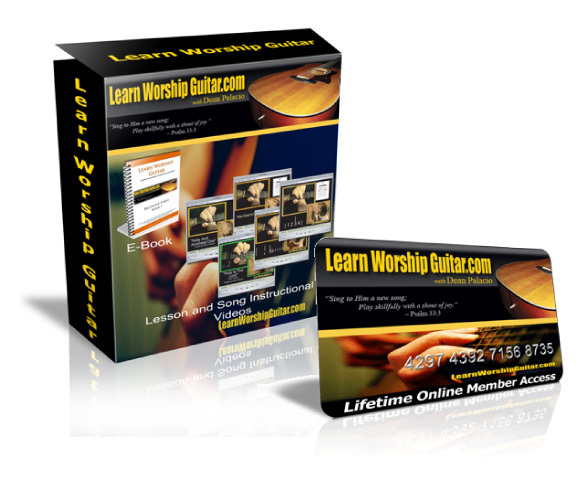 Many passionate hours were dedicated to making this a quality, top notch "online virtual lesson" tool so you can succeed quickly as a worship guitarist! Included are special offers and cool extras I am offering along with this release. Make sure you sign up! You don't want to miss future offers! 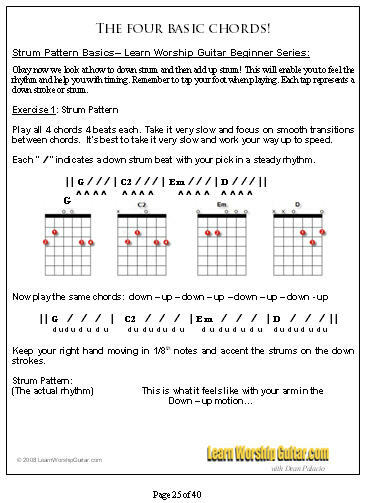 Lesson and song videos are ready for you to start learning and playing today! Blessings . . . ! 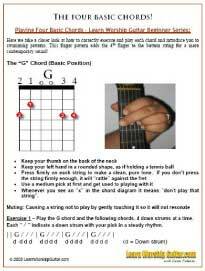 email for 7 FREE Lessons and a FREE "Chords Made Easy Guide!" 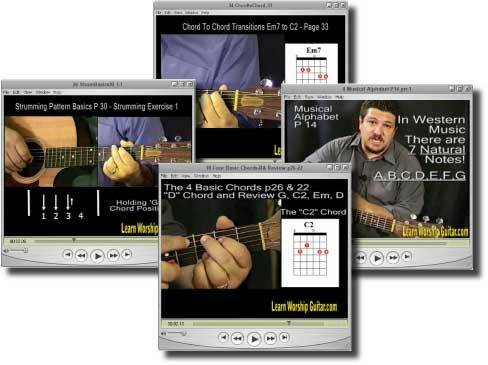 Instant Crisp and Clear Quicktime Streaming Lesson Videos! Quick Order and Instant Access! The Complete Package Is Ready For You! Instant Online Access Upon Purchase! Get Yours Now Only $47 - No Monthly Fees!